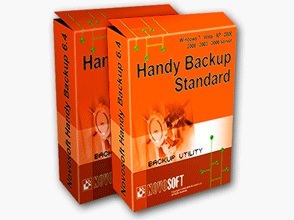 Handy Backup Standard by Novosoft is an award-winning automatic data backup and disaster recovery software. It is a great and ultimate solution for your backup needs. If you have Handy Backup Standard installed, you do not need to worry about your data. It is very easy-to-use and designed to perform automated backup of your computer. User-friendly interface and a rich set of backup features make it one of the best PC backup software for home and small office use. You can read more details and features of Handy Backup Standard on its official website. # Visit Handy Backup Standard features page and post the feature which you like most about the software in the comment box below. You must post a valid feature for successful entry in the contest. # I will randomly select 10 winners from the successful entries. # Share this post on Facebook to increase your chance of winning the Software. This is optional. But I will really appreciate if you Tweet or share this post. it is very needful to have a very good backup program, because there is a great probability to lose all the files after computer crash! thank you for offering this great backup program to us. I have visited Handy backup official sire and read all the features that it have. And the most useful feature for me is the following : Variety of supported storage media. Backup to DVD, CD, any local or external HDDs, network drives, remote FTP servers. It is great that I can store my backup files anywhere! And it means that I can restore my files from four locations, and this is cool! I think it is necessary to save backup files in these four locations because you have a huge possibility to restore files. thank you again for giving us this great program. Useful choose a full, incremental, or differential backup. * Support for storing media. Backing up to DVD, CD, all types of fixed and mobile HDD, network devices, servers, FTP. * The backup option. Handy Backup Standard allows you to backup data compression, encryption, verification and other options for backing up the most convenient and smooth. * Schedule backup flexibility. Handy Backup Standard implementation of all tasks backup and synchronization on a regular basis by specifying a timetable. Free plug-ins. There are presets and plug-ins designed to facilitate My Documents backup, Windows registry backup, Outlook backup, etc. Backing up you HD is a very wise thing to do. If you own many valuable software programs, then you ARE going to want to back them up. If your HD crashes or gets Hijacked or destroyed by a virus or malware, then you will cry as I did and wished you had backed up my system. Thank you for this really great giveaway, very good and useful software and thanks for the chance! I’m excited abt the new Integrated Remote Backup Service. Please count me in ur giveaway.